There are many items of antique value at Niranam Church. But unfortunately, many of them have not been secured and taken care of, probably since all of them were regular items for the members of the church. There are granite pillars with carvings of various shapes lying around, which were parts of the previous church building, ‘Nadaka Sala’ (theatre) etc. Some of them have been used as pillars of the LP School and as parts of the compound wall. The tall, granite Cross in front of the church, at the right side of the entrance, is a relic of the past, probably dating to AD 1259, the time at which the third renovation of the church building took place. 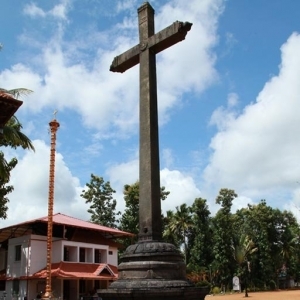 The base of the Cross, has carvings resembling to Hindu Temples. Some of them are elephant, lotus, fish etc. There is a stone with undeciphered letters carved on it. The date of the stone and the meaning of the inscription has not been determined. Antiques in wood, such as the top of the altar of the previous church building, other sculptures depicting the Holy Virgin with Jesus (after crucifixion) in her lap etc are also displayed in the church. Some other articles used in the church previously, such as the palanquin (‘manchal’) used by bishops, various kinds of ancient lamps (‘koothuvilakku’ etc), utensils, a box made out of soft wood (‘murikkin petti’) etc are maintained in the same room where the coat used by Parumala Thirumeni is kept. There are paintings on the front wall of the main altar depict the second coming of Jesus. Paintings of St. Mary, St. Behanan and other saints and church fathers are also kept in the church. A statue of St. Mary carved in marble and another in pure gold are the proud possessions of the church. These are assumed to be remnants of the Roman Catholic invasion of the church during the 16th century. The story of the stolen golden Cross of Niranam has become almost like a legend. The holy cross of the church, made of pure gold and set with precious stones, was unrivalled in craftsmanship and cost. A thief called ‘Kolappan’ stole the same in 1915 and broke it into pieces. Now, a new cross has been made in gold, which is being used during special evens at the church. There are plans to build a ‘Marthoma Smrithi Mandiram‘, which shall be converted into a museum, to display the antiques at the church and ancient documents.